The Morris University Center Welcome Desk is the hub for many activities sponsored on and off campus. This is where faculty, staff, students, and visitors can receive the information they need. The Welcome Desk is your resource for directions, lost and found, event tickets and any other questions you might have. The MUC Welcome Desk is also where you can rent lockers in Alumni Hall and Founders Hall. 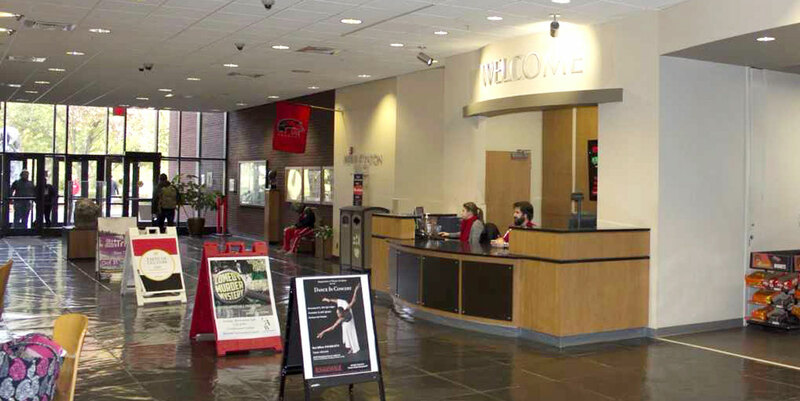 The Welcome Desk regularly sells Madison County Transit bus passes and tickets for various events on and off campus. If you have questions about what tickets are currently available, call the help desk at (618) 650-5555 or visit the desk on the first floor of The Morris University Center. The Welcome Desk is happy to work with you for selling your tickets at the Welcome Desk and online. This complimentary service is available for SIUE Registered Student Organizations and SIUE Departments. Ticket request must utilize the Ticket Request Form and speak with the Assistant Director for Guest Relations no fewer than 7 days prior to the event date. Ticket request can take up to 48 hours to process so plan accordingly to have your tickets on sale when you would like.